International Journal of Engineering & Technology is a double-blind peer review online journal published by Association for Anglo-American Studies, Macedonia. It is dedicated to the publication of high-quality research articles, short communications, and review papers on all aspects of Engineering & Technology and related areas. The objectives of this journal are to chronicle the important publications in the rapidly growing field of Engineering & Technology and to stimulate research in the area. It is an openly accessible journal published bimonthly and it provides a platform for scientists and academicians all over the world to promote, share, and discuss various new issues and developments in different areas of Engineering & Technology. All manuscripts must be prepared in English and are subject to a double-blind peer review process. Generally, accepted papers will appear online within 8 weeks. The scopes of the journal include, but are not limited to, the following fields: Research on Mechanical Engineering; Research on Civil Engineering and Architecture; Research on Digital Technologies; Researches on Powertrains and Automotives; Researches on Electrical and Electronic Engineering; Research on Sustainable Energy; Research on Energy; Research on Industrial Engineering; Researches on Automation and Control; Research on Vehicle Design; Researches on Automatic Control and Information Sciences; Research on Control Science and Engineering; Research on Wireless and Mobile Technologies; Research on Optoelectronics Engineering; Research on Embedded Systems; Research on Mechanical Design and Vibration; Research on Instrumentation Technology; Research on Sensor Technology; Research on sea-based offshore platforms, etc. This journal is published bimonthly (Feb-Mar, Apr-May, Jun-Jul, Oct-Nov, Dec-Jan) in the online version and it is free to access and download. Individual items can be published as soon as they are ready, by adding them to the CURRENT volume. 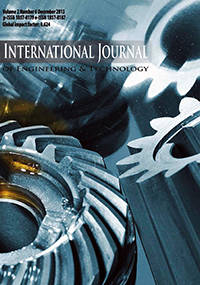 Disclaimer: Articles on International Journal of Engineering & Technology (IJET) have been previewed and authenticated by the Authors before sending for the publication. The Journal, Chief Editor and the editorial board are not entitled or liable to either justify or responsible for inaccurate and misleading data if any. It is the sole responsibility of the Author concerned.